Click this image to download a PDF scan of one of the first TCC country lists, published in Nov. 1965. In 1954 overseas leisure travel was still a rarity. It was the early days of international travel and the jet age was still four years into the future. Ships plying the oceans only provided transportation, not cruising as we know it today; the America to Europe voyage took several days. Visiting 100 countries was an accomplishment that most people could only dream of and few had realized. After all, it took considerable time and money! The idea of forming a social club for those privileged few who had attained this feat was born in 1954 in the Los Angeles offices of Hemphill Travel Service. Bert Hemphill, the owner, known as the “Dean of Travel,” had pioneered deluxe around-the-world escorted tours by air. He had a loyal following of clients who traveled on his exploratory tours. Hemphill, who originated the concept (a somewhat controversial point) was, nevertheless, instrumental in getting the Travelers’ Century Club started for those who had visited 100 countries. However, it was his tour director, Russell Davidson, who made it a reality and handled its administration. Hemphill was the club’s first president and Davidson was secretary until his passing in 1987. Davidson had also served as president. By 1960 there were 43 individuals who submitted qualification lists proving they had traveled to 100 or more countries. These travel pioneers thus became the charter members of TCC. Many were clients of Hemphill Travel; some were the agency’s own tour directors. Ruth Nelson, who was present at that initial meeting in 1954, recalls that, at that time, she had been around the world, visited many countries in Central and South America and toured the major countries of Europe, but she admitted that, “it would be several years before I qualified as a TCC member upon reaching the magic 100.” By that time Nelson had opened her own travel agency. She later became TCC president and served on the board of directors for some 20 years. At the February 2, 1960, TCC board meeting, the club officers selected a slogan among several suggested – “World Travel…the passport to peace through understanding.” A press luncheon to announce the formation of the new organization was held the same day. 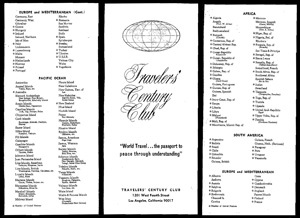 The first open meeting of the Travelers’ Century Club was held at the Biltmore Hotel in Los Angeles on April 28, 1961, with 27 members in attendance. Most were from the greater Los Angeles area but some came from Santa Barbara, Palm Springs, San Jose, San Francisco, Honolulu and Austin, TX. Much of the discussion was about the purpose and goal of the club. It was determined that the initiation fee would be $25, annual dues $10. Today the initiation fee is $100, annual dues $75, international dues $85. At that 1961 meeting, it was decided that the club should incorporate and by-laws should be drawn. The decision was also made to publish a newsletter, The Centurian, four times a year. By 1980 the club had incorporated, received tax exemption status and obtained insurance. It is a nonprofit, non-stock corporation. There were then about 300 members, and from that time on the club has grown in membership, with more than 1,400 worldwide members today. The club gradually separated from Hemphill Travel. In the 70s several travel agencies and tour operators were handling tours to interesting and unique destinations. It was felt that TCC members should have access to many sources of information and booking possibilities. Some TCC members are in the travel industry. Following the passing of Russell Davidson, who had been handling the administration of TCC, his widow, Roe, took over for a short while, but much of the work was being handled by Klaus Billep and his staff at Universal Travel Systems in Santa Monica, CA. When Roe passed away, the entire administrative responsibilities were transferred to Billep, who was president at the time. There are 10 volunteer officers and board members who determine the club’s rules and policies. They meet four times a year and communicate in-between meetings. There have been 26 presidents, five of whom have been women. Traditionally, presidents serve for two years. TCC members have traveled together to hidden corners of the world and to such distinctive places as the Northwest Passage, Central Asia (the “Stan” countries), West Africa, the World Heritage sites of North Africa, islands of the Indian Ocean, the Marquesas and Tuamotus, Cape Horn to Cape Town cruises, the South Atlantic islands, including Bouvet Island, Greenland/Iceland/the North Pole, North Korea, the outer islands of Britain, Barrancas del Cobre, and they have circumnavigated Antarctica and cruised in those waters. The original list of qualifying “countries” was put together by Russell Davidson. When Sanford Smith, an attorney in Vineburg, CA, became a board member in the 70s, he headed a country qualifications committee which refined the criteria. As the longest-serving board member, Smith, who has traveled to over 300 countries, has a vast knowledge of geography and is also a radio ham amateur. He looked at the qualifying nations put together by the American Radio Relay League and used that as a guide. The TCC Board then made some modifications to that list and, as a result, added 35 destinations and dropped about 15. This exclusive travel club’s Official List of Approved Countries & Territories today is 325, grouped in 12 regions. TCC acknowledges that some of the 325 places are not actually countries in their own right, but they have been included because they are removed from parent countries, geographically, politically or for other reasons as outlined in the club’s rules. Examples are: Easter Island which belongs to Chile (two credits), Antarctica which has seven territories and Alaska which is counted separately from the rest of the U.S. Bali (the Lesser Sunda Islands) is separate from Indonesia and Madeira is counted separately from Portugal. The list of destinations is modified as changes occur. For instance, TCC does not generally add countries until they become officially or de facto independent, two recent examples being East Timor and Kosovo. Some places on the list may temporarily be inaccessible or closed to visitors, such as Wake Island and the Midway Atoll. When the Republic of South Sudan became an independent state in July, 2011, it became the 321st TCC destination. At its December, 2013, meeting, the Board added Nueva Esparta (Marguerite Island), Egypt/Asia (Sinai Peninsula) and Equatorial Guinea (Bioko Island). Socotra Island (part of Yemen) was added at the December 2014 Board Meeting. The list is posted on the TCC website — www.travelerscenturyclub.org. To become a member, it is an honor system for the first 100 qualifying places but then members must complete an up-to-date destination list to be approved for the next level and to be recognized in The Centurian. There is also a category list of “retired” countries and territories; these are areas recognized as nations in the past. Those who have been to 75 places can become Provisional Members. Members are serious about visiting the destinations and most stay at least a day or two, or more. They are encouraged to do so, but short visits, even a port of call or a plane fuel stop, qualify as a stay. (Some places may be too dangerous or too remote to allow longer stays.) However, one must actually set foot in the destination. Members receive a membership card, certificate and a pin when they join. Then they are honored when they reach different levels: 150 (Silver), 200 (Gold), 250 (Platinum) and 300 (Diamond). They receive a revolving crystal globe when completing visits to all the TCC places. Members who have visited all the TCC countries and territories on the TCC list as of the date of their travels are: John Clouse, Parke Thompson, John Todd, Jeff Shea, Ken Ziegler, A. Allman, Don C. Buckley, Charles Veley, Gig Gwin, Robert and Dorothy Pine, Bill Altaffer, Ray Woods, Dietrich Deppe, Bart Hackley, Rowland Burley, Audrey Walsworth, Robert Spehar, Ron Endeman (the first sitting TCC President to reach this milestone), Phyllis and Bob Henson, Bob Bonifas, Don Parrish and Tim Carlson. Stephen Warner and Charalampos Bizas each need to travel to three more on the TCC List. Many more have been to 300 or more destinations. It has not been an easy task to accomplish visits to all the destinations. The British Indian Ocean Territory, site of the U.S. Naval Base at Diego Garcia, is considered by many to be the most difficult place to reach because there is no commercial transportation. A dozen TCC members managed to charter a boat out of the Seychelles. It was a five-day voyage each way. Later, a TCC group chartered a boat to BIOT from the Maldives. Members often get together and form their own tours or transportation to a hard-to-reach destination to help defray expenses. TCC members often take cruises as a group or discover other TCC members during a cruise. In March, 2015, some 30 TCC members from the U.S., Costa Rica, France, Germany, Greece, Portugal and Singapore sailed together from Ushuaia, Argentina, to the Cape Verde Islands. The 35-day cruise was centered on a visit to illusive Bouvet, the most remote island in the world, but, once again, rough seas prevented a landing. Nevertheless, the TCC members had a great time together and did add some destinations to their lists. Today the 1,400 TCC members are from all parts of the United States and all over the world. The club does not solicit membership and resists commercializing. Growth has come from word-of-mouth and many people read about TCC in national magazines, newspapers or on the Internet. Articles about TCC have continued to grow. In addition, members on some of their unique trips come across other well-traveled people and tell them about TCC. Many are surprised to find they have traveled to so many countries when they check the list. Members frequently run into other TCC members during their travels, especially to remote areas. This provides an immediate bond. The first TCC meeting outside the Los Angeles home base was in the early 80s in San Diego. Luncheons later were held in both Los Angeles and San Francisco. Today there are four luncheon meetings each year, alternating between Orange County and the Los Angeles area. The San Francisco chapter meets separately, also four times a year, and a separate San Diego chapter was launched in 2012. The Los Angeles/Orange County attendance ranges from 65 to 100. Programs include a presentation by a member about his or her recent travels to an off-the-beaten-path destination or about an unusual experience. There are also outside guest speakers. Since members live all over the U.S., chapters have sprung up in other areas. The first chapter established outside Los Angeles was in the New York area, in the early 70s. New York has about 100 members who meet three or four times a year. The next chapter was in the Denver area, established in 1989. It usually meets every other month.The first meeting in the Chicago area was in 1997 and Miami was added the following year. Though there were several San Francisco Bay Area luncheons and dinners in the 80s and 90s, with many members from Southern California in attendance, the first formal Northern California chapter meeting was in August, 2001. Chapters have been added in the areas around Sarasota, Little Rock, Phoenix, Kansas City, Boston, Philadelphia, Texas (alternating between Houston and Dallas), the Washington, D.C. area, Indianapolis and St. Louis. The first overseas chapter was in the United Kingdom (London) in 2006. A new chapter in Eastern Canada (Toronto) was launched in 2010, one in Germany in 2011, and Western Canada (Calgary) in 2013. At this time, there are 20 chapters worldwide. Each chapter determines its format and where to meet, which can be in a member’s home, at a private club, a restaurant, or even at an outdoor venue. Each chapter coordinator reports about the activities of his or her area for The Centurian newsletter and also provides photos. Some chapters meet every other month; others meet two or three times a year. Some have formal programs with speakers and videos; others gather to socialize and exchange travel experiences. The UK chapter sometimes meets in other European countries. Many TCC members visit other chapter meetings. Updates on chapter meetings and photos are also on the TCC website. To celebrate its 50th Anniversary, the Travelers’ Century Club held two special weekend functions in 2004 – in New York in April and in Las Vegas in October. The club has had four international meetings. The first was in Monte Carlo in October, 1999; the second was October 26-28, 2007, in London, in cooperation with the UK chapter, which also hosted the third international meeting in Dublin, April 17-19, 2009; a fourth international meeting was held in Berlin, September 21-24, 2012, in cooperation with the new German chapter. These TCC globetrotters enjoy sharing their travel experiences in an environment of like-minded people, with travel as the common denominator. Since many members have traveled together, the meetings are like reunions and all seem to enjoy the camaraderie and friendship. Many deep relationships have thus been formed. This exclusive travel group comes from all walks of life. They are not asked about their background when they join. Some have traveled overseas for business purposes, some have been in the military –and all have a curiosity about learning about new places. Most members are in their autumn years and are retired or semiretired because it does take time to visit these destinations. However, there is an increasing number of younger members. Some members like to collect destinations, like other people collect stamps, paintings, dolls, spoons or coins. Some first became interested in travel at an early age because of stamp collecting or by traveling with a parent or by reading books. It has taken persistence and ingenuity (and money) to reach some of the out-of-the-way places. TCC helps provide a focus and inspiration to travel to new territories. Besides the educational programs at the chapter gatherings, TCC also educates its members with Info Files. These are one or two pages, noncommercial, and written by members following trips to unique destinations. They contain observations and information not found in the usual guide books. They are for TCC members exclusively, and may be obtained on the TCC website, or by print if the members do not have access to the Internet. (Dues are $10 additional.) Back copies are available for $1.00 each. There are about 800 Info Files but many have been deleted because they were out of date or contained generic rather than specific information. Exchanging information about hard-to-reach destinations is one of the primary benefits of membership since many travel agents do not want to or cannot handle arrangements for those difficult-to-reach places. Members who have previously traveled to such places can provide helpful advice on how to get there, what to expect, and other tips. They can supply information on difficulties and hazards as well as on things not to miss. As a result, a password-protected social networking website, called the TCC Forum, was established in 2011 as a member benefit. Access to this private members-only online community is by invitation only. Members may use the site to post personal travelogues and photos, seek specific travel advice or discuss a wide range of travel-related topics with other participating members. This is now the site where members can access the new Info Files listed in each issue of The Centurian, as well as links to past issues of the newsletter. Continuing its pursuit of social media channels, TCC launched a Facebook page last year. Most members would agree that a key benefit of membership is the worldwide recognition or the “bragging rights,” since few people have visited 100 destinations. Many say that being a TCC member has changed and enriched their lives. They look at the world in a different way. They have been in parts of the world where they have experienced history in the making. They are more familiar with foreign policies and places where world events are happening and they have become more tolerant. Some do not have the desire to go to all the places on the list, preferring, instead, to return to those destinations they have most enjoyed and to get to know more about the countries, the people, culture and history. Most do a great deal of research before visiting a destination. They are savvy about keeping safe and dealing with adversity and diversity. Though travel is easier today – except for security restrictions — and less expensive, as the world has become “a global community,” many members nostalgically remember when countries were more distinctive in their cultures and travel offered more discoveries. Even though there are more similarities today, there are still those far-flung outposts waiting to be discovered by the true adventurer who always finds it exciting to go to a destination not previously visited.